Heat oven to 325°F. Grease and flour 2-quart round casserole or 2 1/2-quart ovenproof bowl. Make 1 box cake batter as directed on box. Pour into casserole. Bake 1 hour 5 minutes to 1 hour 15 minutes, or until toothpick inserted in center comes out clean. Cool 15 minutes. Remove cake from casserole; place rounded side up on cooling rack. Cool completely, about 1 hour. Make, bake and cool remaining cake mix using same casserole or bowl. In medium bowl, place frosting; tint with 9 drops yellow and 6 drops red food color to make orange frosting. On plate, place 1 cake, rounded side down. Spread 2/3 cup of the orange frosting over cake almost to edge. Place second cake, rounded side up, on frosted cake to make round shape. Spread a thin layer of frosting over entire cake to seal in crumbs. For easier handling, refrigerate or freeze cake 30 to 60 minutes. Frost entire cake with remaining orange frosting. Trim ice-cream cone to desired height for stem; place upside down on cake. Cut out eyes, nose, mouth, vines and leaves from fruit snack rolls. Place on frosted cake to form face. Store tightly covered. You may want to bake the cake a day ahead so there’s not a long wait and those involved in the decorating are at their creative best. 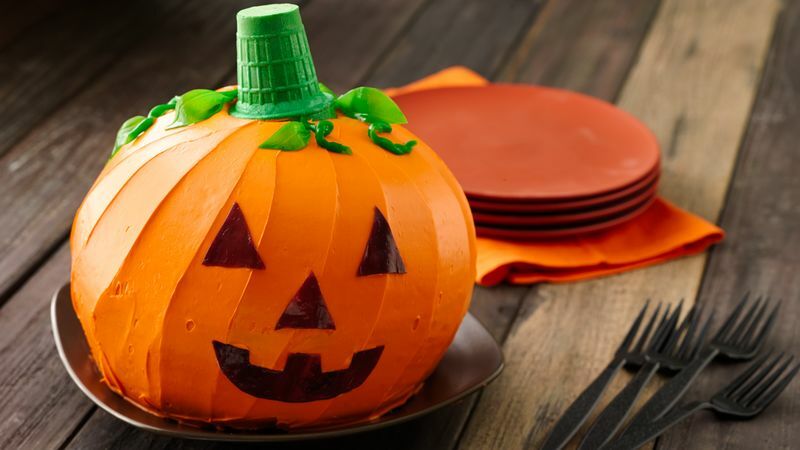 Just for fun, replace your usual entry in the pumpkin-carving contest with this tempting dessert.